A little Shimmer and A little Glitter / Makes a great sampler if you cannot decide which color to choose. Order which ever ones you wish. This makes a great sampler of most of my votives. 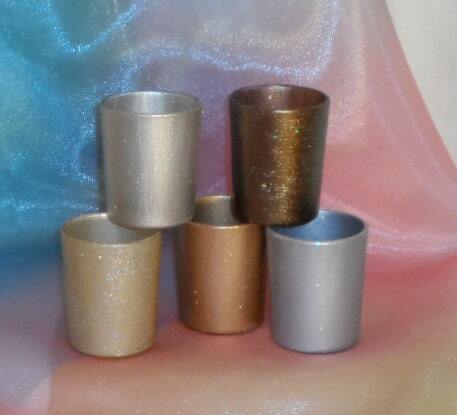 Colors - all these votive holders have a bit of glitter. If you want to see more photos ... copy the link below to your browser - this will take you to my google photo drive and you can see more detailed photos there. If the cost of Shipping costs scare you - Shipping in bulk of 10 or more is always cheaper than the price here. Etsy prices shipping on quantity - Post Office ships on weight. Convo me for details. I need to know your state for shipping and also your event date.